the horse described in C. below. Owner warrants that he/she owns the horse and that the horse is negative for Coggins and is free of disease. A. Fees: All fees are subject to change given 30 days written notice by the Domnarski Farm. 1) In consideration of $395 per horse per month ( or $14 per day) paid by owner in advance on the first day of each month, Stable agrees to board horse beginning ______________________on a month-to-month basis. Fee includes daily turn outs, stalls cleaned daily, hay and grain twice a day fed by stable as morning and evening feedings. Special needs, medicine, treatments can be arranged by separate agreement. 2) A late fee of $25.00 will be accrued per horse on the 15th of each month. 3) If horse damages feeder, hay rack, waterer, etc. owner agrees to pay for a replacement item of similar quality. Stable agrees to provide labor to replace damaged item. 4) Reasonable additional fees will be charged according to rates posted in tack room. These fees will be billed to owner. Such bill shall be paid within fifteen (15)days from the date it is submitted to Owner. 5) Options to basic fees paid in a timely fashion are listed below. Each optional service requested must be initialed by Owner. These options can be changed at any time the Stable receives written notice from owner. and additional agreed upon services and shall have the right, without process of law, to retain said horse until the indebtedness is satisfactorily paid in full. D. Standard of Care: Stable agrees to provide normal and reasonable care to maintain the health and well being of said horse as stated in (A.1). choose another farrier but agrees to take full responsibility in scheduling and paying farrier. F. Veterinary Information & Emergency Care: If emergency treatment is needed, Stable will attempt to contact Owner but, in the event Owner is not reached, Stable has the authority to secure emergency veterinary and or farrier care. Owner is responsible to pay all costs relating to this care. Stable is authorized as Owner’s agent to arrange billing to Owner. Dr. Sarah Newton of New Braintree, MA (508)867-0425 & fax (508)867-3321 is Stable’s designated veterinary hospital for routine and emergency veterinary care. Owner authorizes stable to administer medications and/or treatments. 1. No smoking on ANY Domnarski Farm property, including inside vehicles on the Domnarski Farm. NO EXCEPTIONS. 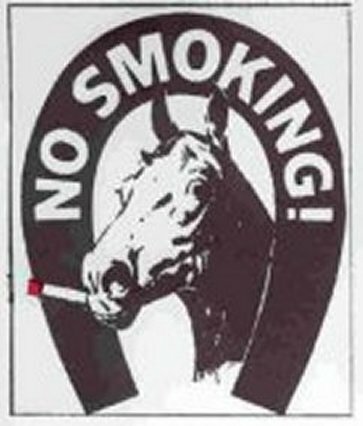 Violation of smoking ban by the owner, owner’s farrier or guests will cause for dismissal of horse from the Domnarski Farm and forfeiture of any fees already paid. 2. Horse Owners, and/or any one else the Horse Owner allows to ride their horse(s), has a signed “Waiver of Liability and Assumption of Risk” on file with the Domnarski Farm. 3. Horse Owners and their guests shall conduct themselves in a manner which respects the person and property of others, the safety of all persons and horses, and exercise good judgment in all activities undertaken at the Domnarski Farm. 4. Newly-arrived horse(s) shall be on probation for a period of 30 days in order to determine whether or not the horse(s) is/are compatible with the care arrangements at the Farm. As soon as such a determination has been made, the Horse Owner will be notified. If the horse(s) is/are to be removed, the Domnarski Farm and Horse Owner will arrange for such action as soon as possible. 5. Supply a copy of current negative coggins test to Domnarski Farm. 6. Supply evidence of spring shots from the most recent spring. 7. Supply copy of bill of sale, registration paper, jockey club papers or other form of proof of ownership. 8. Maintain the normal annual immunization program as recommended by your veterinarian, with a record copy to Domnarski Farm. 9. Maintain a farrier schedule. 10. Pay for the administering of drugs, supplements and medications provided by the Horse Owner at an agreed upon service charge. 11. You are responsible for providing fly spray and/or masks for your horse during insect season. 12. For sick care the rate of $20.00 per hour or any portion thereof may apply. 13. Supply a list of all authorized riders of your horse. All riders must have a completed liability release form on file with Domnarski Farm prior to riding and must abide by Domnarski Farm rules while on the premises of Domnarski Farm. 14. Any rider under the age of seven years must have adult supervision while riding and while in the barn area. Riders ages seven through twelve years of age must have an adult in attendance while riding and while in the barn area. 15. Prior notice should be given to Domnarski Farm when taking your horse from the premises. 16. Horse owner is responsible for any damage done by his/her horse, his or her self, his/her companions, or Horse Owner’s authorized user, to Domnarski Farm property. 17. Domnarski Farm has the right to immediately terminate this agreement with Horse Owner, without refund, for abusing any horse on Domnarski Farm property, or for repeated improper behavior or violation of Domnarski Farm rules. b. Horse Owner fails to make scheduled payment. a. Any accident or injury to horse, Horse Owner, his/her companions or Horse Owner’s authorized user. b. Damage to or the theft of any tack or other personal belongings of the above mentioned. 20. Horse owner shall not use tack or personal property of another without authorization. 21. Horse owner will give a one month’s notice if terminating this agreement. All bills must be paid before horse leaves Domnarski Farm property, unless otherwise agreed upon. 22. No alcoholic beverages or drugs allowed on premises. 24. Do not bring children that require a babysitter without also bringing the babysitter. Do not allow any children to play in any area where there is horse traffic, or in any paddock or riding ring. No one of any age is allowed to run in the barn, screech, scream, clap or do anything else that will spook a horse, without reasonable cause. You are responsible for yourselves, guests and children. Owners of animals are exclusively allowed in the paddock areas and riding areas. Guests and children should not be present in these areas unless they are working with an animal. 25. No screaming, yelling, running or disruptive behavior. 26. Communication is encouraged. Feel free to leave notes on the message board. 27. Sweep up aisle when finished with your horse. 28. If your horse poops in the riding ring or round pen while working, please remove it. 29. Please put away all your belongings when you are finished working with your horse. 30. Please check lights and any doors or gates that you may have opened before leaving, turned off water and drain hose. 31. Please return all tools such as pitchforks, brooms, wheelbarrows, etc. to the place where they belong when you are done using them. 32. Due to limited storage space, please keep excess equipment/blankets rarely used at home. 33. For the above reason, please keep all equipment/blankets stored properly on racks provided. 34. Please hose horses outside only. 35. All large trunks must be stored in the loft. One small trunk may be kept in tack area. 36. The hayloft is to be kept dry at all times. Do not open the access doors to the loft during a time of precipitation. 37. Please inform management of any farrier/vet/instructor visits as early as possible. 38. Riding areas are for general use. If you require the ring to yourself (i.e. for a lesson), please post your scheduled time in advance, to allow the farm and other boarders ample notice. 39. For our own protection, guests who will be riding must sign a liability release. 40. You are expected to be present for any vet/farrier visits, for general safety. Should you not be available, you may employ management services at prices listed on inclusion sheet. 41. We are all to respect each others belongings. Do not help yourself to another’s belongings, supplements or medications without permission. 42. Do not leave any items which may cause injury to animals in any pasture or turnout area. 43. Do not use chemicals that are not environmentally safe. Never dump any wash water or empty any container in a pasture area or an area accessible to horses. 44. Please do not operate the spreader or tractor. If you have an uncontrollable urge to pick out your stall, please use the wheelbarrow and empty it into the appropriate pile. Please do not leave the wheelbarrow full of manure or blocking any aisle or entranceways. 45. If someone asks for manure, they are free to take it out of the manure pile. 46. Do not modify any stall, structure, fencing or any other object, or rearrange any area of the barn without gaining permission of the barn owner. 47. Do not give any horse treats other than your own, without permission of the owner. 48. Do not ride any horse, or allow your companions to ride any horse that you do not own. 49. Please do not intentionally ride on the lawn or in the garden or flower beds. 50. Please do not bring barn cats. equipment on the premises of Domnarski Farm, and to any of their heirs, successors, and assignees. I agree to ask the owners of Domnarski Farm for clarification of any rule or safety procedures, for further instruction as regards anything that I do not understand about the equipment and the animals, or as regards anything else that may affect the safety of, or riding of, horses on the premises. I also acknowledge that the owners of Domnarski Farm strongly recommend the use of relevant equine safety gear, such as helmets, but do not specifically require its use. As such, I accept full responsibility for any and all injuries whether or not I choose to accept this recommendation. I have fully read this Waiver of Liability and Assumption of Risk carefully and understand that by signing below I am agreeing, on behalf of myself, my estate, my heirs, representatives and assigns not to sue Domnarski Farm, its owner Lisa A. Domnarski and/or horse owners with animals stabled there, or to hold him/her/them liable for any injury, including death, from riding horses. I understand the terms of this waiver of liability and assumption of risk, and I intend to be fully bound by this agreement. As the parent(s) or Guardian of the applicant, We/I hereby certify that this applicant (child) is less than 18 years of age. We are/I am aware of the risks incurred in riding horses and the other horse activities described in the waiver and have discussed them with our/my child. We/I have discussed the rules and safety procedures with our/my child and are/am satisfied that s/he understands them. We/I understand that by signing below we are/I am agreeing, along with our/my child, on behalf of ourselves/myself, our/my representatives and assigns, not to sue Domnarski Farm, its owners, or other horse owners with animals stabled there, or to hold him/her/them liable for any injury, including death, that results from our/my child riding horses or from any other horse activity. We/I understand the terms of this Waiver of Liability and Assumption of Risk, and We/I intend to be fully bound by this agreement. Under Massachusetts Law, an equine professional is not liable for injury to, or the death of, a participant in equine activities resulting from the inherent risks of equine activities, pursuant to Chapter 128, Section 2D of the General Laws. 2) Do everything possible to administer aid to the horse, e.g., broken leg, but immediate loss of life not eminent. 5) If the horse needs to be transported to a veterinary hospital, who do we contact to move the horse? 6) Is the horse covered by insurance? If so, what is the name of the company and the telephone contact number for the company? Tetanus, Strangles & Encephalitis vaccinations once a year. Intranasal flu and Rhino every 6 months or every 3 months if intra-muscular. Parasite program to include de-worming every other month or a daily worming program.. STABLE will not provide exercise or any other care for said horse(s). no matter how catastrophic, connected with boarding or for any other reason for which the horse is on the premises of Stable, are to be borne by Owner. J. Hold Harmless: Owner agrees to hold Stable harmless from any claim resulting from damage or injury caused by said horse and agrees to pay legal fees incurred by Stable in defense of a claim resulting from damage by said horse. Termination: Either party may terminate this Agreement given thirty (30)days notice to the other. In the event of a default, the wronged party has the right to recover reasonable attorneys ’ fees and court costs resulting from this failure of either party to meet a material term of this Agreement. Owner cannot assign this Agreement unless Stable agrees in writing. We do not owe you an explanation of any sort as to why you were accepted or rejected. We are here because we love horses and want to provide good care to yours. We try to balance the needs of each horse within the parameters of our farm, budget, and the needs of other horses. Please help us determine your horse’s needs so we can maximize his comfort at Domnarski Farm. Full board includes quality grass hay and grain. We can determine their diet from their condition and will adjust accordingly. Do you have any preferences? One turn-out is defined as each time a horse is removed from stall and left out in paddock, loafing shed, arena or pasture and then returned to stall OR a 12 hour period. For outside winter turnouts we require you to provide a waterproof blanket/sheet if horse is blanketed in stall. Turn-outs areas and time to be determined by us. Boarded horses are turned out individually unless Stable and Owner have determined otherwise. Since stable can lower stall cleaning costs on horses placed out overnight, these horses may receive more turn-out time under general boarding agreement. How often will your horse be taken off the property and returned for showing, hunting, lessons, trail rides, etc. We keep a daily log in the tack room which is available for you to review at any time. It lists which horses were turned out that day, where, and who did it. Who fed grain or hay that day. Which farriers or vets were/are scheduled to visit. Injuries that may have occurred or medications horses received. A melamine board hanging in the office list which horses have been turned out that week and on what days. It also includes the last time each horse was vaccinated, wormed, or had farrier work. We also keep permanent records of each horse while they are boarded with us. This includes history of vaccinations, wormings, and farrier work. It also includes owner information and medical records on horse. Please ask, if you would like to review your horses permanent records. Thank you for taking the time to fill this information sheet out. It helps us know your horse better.